Android Apps and Games are gaining popularity and are admired by a huge number of fan base. Some of the apps are so essential and games so playful that many opt to use them on their PC rather than a small handheld. There are a number of ways this can be archived. In this tutorial we will expand from the simplest installations to the expert mode. BlueStacks is an application that you install on your Windows or Mac. It will bring all your favorite application to your computer in just few simple steps. To start off, download the BlueStacks App Player from : http://www.bluestacks.com/ following the installation directions to setup the application. 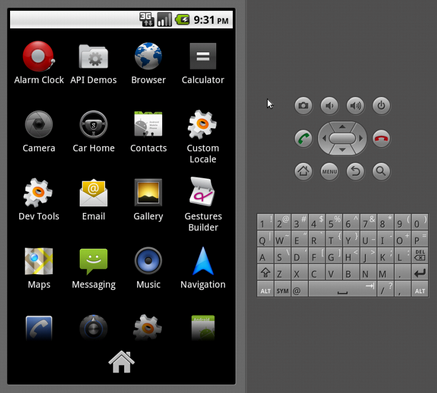 This application is very easy to use and supports a wide range of Android apps and games. Although the SDK is ment to be used by developers can be used by general users as well to run Android applications. To get off you need to download the latest Platform for example Adnroid 4.4 using the SDK program. Once the planform is downloaded you can use the AVD manager to create a virtual machine with Android 4.4 with Nexus as pre-configured device. The device will boot us as image above however you will need have Google apps or Play store. As there is no Play store you cannot simply download an app and run it. To install an application you need to put your desired apk into the tools folder of your SDK. Use the command prompt in that directory while the AVD is running. The application should not be available on your Android Virtual Machine. The third option is to load Android directly to your PC for usage. Although the method requires you to boot a new operating system to your PC it is recommended as it will provide you with a flawless experience of the application. Head over to the Android-x86 Project where a group of developers and working to bring Android to regular x86 machines. This method is recommended for expert users as you will need to Dual Boot your device in order for it to work properly as and Android device and also use your default computer system for example Windows 7.